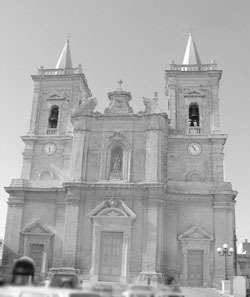 Information: Tarxien became a parish in 1592 and the present parish church was built on the site of three small churches dedicated to st. Paul, st. Luke and st. Nicholas respectively. The altarpiece was painted in 1874 by Pietro Gagliardi. Name: Parish Church dedicated to the Annunciation to Our Lady Dedication date: 9 May 1782.